Showing results for tags 'ovenbake'. I had to do a double take when I saw a that JD's Best made a gluten-free microwave or oven baked personal sized pizza! How in the world can they make a gluten-free microwavable pizza? I was a bit skeptical since it is hard enough to find a gluten-free pizza that I can pop in the oven and fully enjoy, let a lone one that I could microwave. I decided to give JD's Best Microwave/Ovenbake Personal Gluten-Free Pizza a try – one from the microwave and one from the oven. Included in their packaging was a silver disk that is used to crisp the crust for those who choose the microwave method. After 15 minutes the oven pizza was ready, compared to only 2.5 minutes for the microwave version. Both pizzas had ample sauce (which is usually one of my biggest complaints about packaged pizzas), and the cheese was bubbling, hot and flavorful. Both pizzas had a crispy crust on the bottom, and the only real difference I noticed was that the one from the oven was a bit more crispy on the top compared with the microwave version. What a great option for anyone on a gluten free diet! 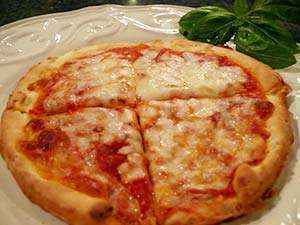 For more info visit: www.jdsbestglutenfreepizza.com. Note:Articles thatappearin the "Gluten-Free Food & SpecialtyProduct Companies" section ofthis site are paid advertisements. Formoreinformation about this seeour AdvertisingPage.